AVLab Internet Security is the PUP that uses misleading techniques to prevent removal. Use Reimage to locate malicious components and get rid of them faster than with uninstall instructions. A full system scan blocks virus reappearance and prevents traffic to malicious domains. How can AVLab Internet Security hijack my computer? How to remove AVLab Internet Security virus? AVLab Internet Security is a computer virus, which seeks to swindle people's money. It can be categorized as a rogue anti-spyware due to the fact that it seeks to imitate a genuine anti-spyware program. Beware that it's just another 'child' from a serious family of malwares that is called 'Braviax'. Most of the rogues from this family act in the same way, i.e. they try to scare people into believing that their computers are seriously infected and trick them into believing that they need a licenced version of the program to fix their PCs. In order to convince people, AVLab Internet Security virus shows how it loads its scanners, then supposedly scans all files and registries and finally delivers a long list of invented viruses. In addition to that, it constantly delivers fake pop-up alerts that remind about critical condition of your computer. No matter how convincing all this performance may appear, do not get tricked. The worst thing that you can do is to buy a license of this rogue. If you have already done that, we highly recommend you to contact the banker and report about this situation. Otherwise, you will loose a considerable amount of money without a possibility to get them back. By the way, buying this license may result in the further thefts from your bank account because you will reveal sensitive data straight to cyber criminals. Keep in mind that AVLab Internet Security has no virus database and is not capable of detecting viruses or even more deleting them. It is only capable of causing a serious havoc on your computer, pretending a real anti-spyware, tracking your keystrokes, slowing down computer's system and implementing other malicious activities. Therefore, if you have already noticed AVLab Internet Security virus on your computer, run a full system scan with Reimage or another reputable anti-spyware as soon as possible. If you think that AVLab Internet Security is already hiding on your computer, you should scan it with a reputable anti-spyware right away and remove all entries that it detects. You should NEVER fall for buying a licensed version of AVLab Internet Security virus because you will only loose your money. If you need a detailed guide explaining how to get rid of this virus using a reputable anti-spyware, read this guide. 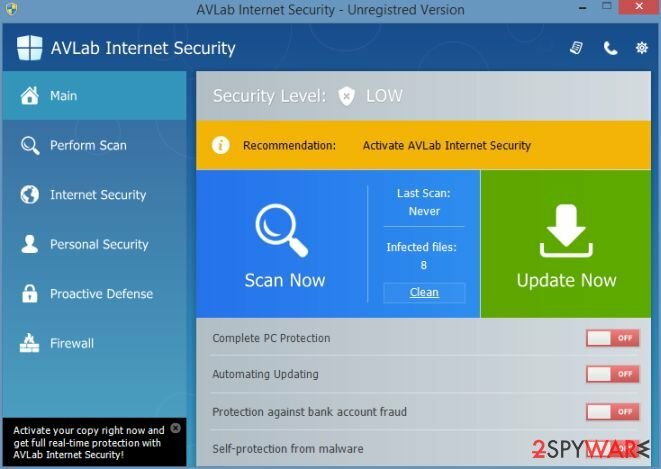 When trying to remove AVLab Internet Security, our recommended programs are Reimage and Malwarebytes MalwarebytesCombo Cleaner because they can easily detect every hidden component that belongs to this and other cyber threats. Click Start -> All Programs -> Accessories -> System Tools -> System Restore. Choose the date and the specific restore point that you want and click Next. Wait until your PC reboots and click OK on the Restoration Complete window. Now download Reimage and run a full system scan after updating it. As soon as your computer becomes active, start pressing the F8 key continuously until you see Advanced Boot Options screen. Here, select Safe Mode with Networking (for that, use the arrow keys) and then hit Enter. Now right click on IE or other browser's icon and select Run As or Run As administrator. Enter your Administrator account password (if needed). Enter this link to your address bar: https://www.2-spyware.com/download/hunter.exe and download a program on your desktop. Launch it to remove malicious files. Click Start -> Settings -> Control Panel and select User Accounts. After a new window shows up, click on Guest -> Turn On Guest Account. Select Guest account for downloading our recommended anti-spyware. Take another computer that is not infected by this virus and download Reimage or Malwarebytes MalwarebytesCombo Cleaner to it. Let AVLab Internet Security start its work and finish its fake system scan. Click on Allow unprotected and close the warning message. Open File Explorer (click Start -> Documents) and enter %AppData% in the location bar. Click enter. Rename guard-agas or similar entry. Download SpyHunter and remove malicious files that belong to AVLab Internet Security. This entry was posted on 2014-12-18 at 02:47 and is filed under Spyware, Viruses. You can quickly scan the QR code with your mobile device and have AVLab Internet Security manual removal instructions right in your pocket. How did you remove AVLab Internet Security?